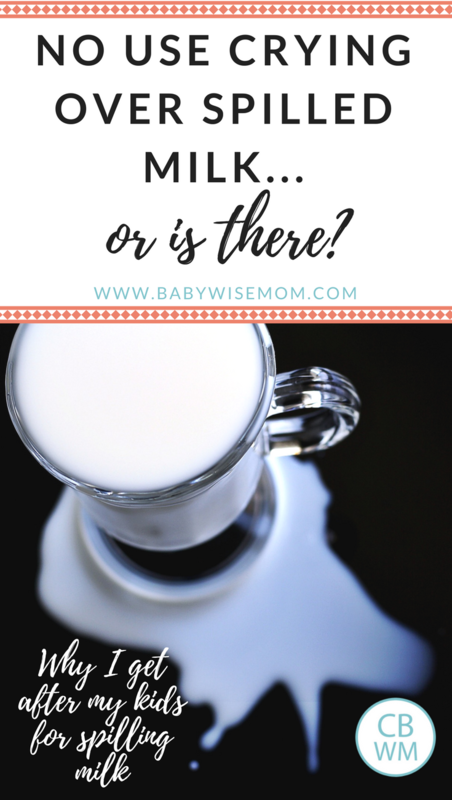 No Use Crying Over Spilled Milk…Or Is There? No Use Crying Over Spilled Milk…Or Is There? Why I get after my kids for spilling milk. McKenna came along and she is decidedly less careful about such things. She is so happy in life that something like spilling milk all over herself isn’t annoying at all. Sure, a nice quality to be happy. Not an inexpensive quality–especially when you get your milk from the local dairy–but it’s not about the money (money, money…). I maintained my patience with her. Then came this glorious April day when I did lose my patience. Here I am, getting ready to go help in Brayden’s class. I needed to have myself ready, Brayden ready, and Kaitlyn ready by 8:40 AM. McKenna did not have to be ready, which is nice since she sleeps until 8-8:30 AM. I know some of you are ready and out the door daily much earlier and might laugh at this being a struggle for me, but you do have to understand that with being pregnant and needing to sit still for at least 30 minutes after I eat breakfast or I will puke all over, it cuts into my abilities. So the scene is that I had five minutes before I needed to be out the door and I hadn’t even touched my hair or make-up yet. I was in my room, not far from the kitchen, while McKenna ate breakfast. She called to me requesting more milk. I hurried out there because she is extremely independent and I knew she would get it herself if I didn’t do it. Despite my hurry, when I arrived on scene she had successfully spilled the entire half gallon of milk all over the bar, floor, chairs, herself….it was everywhere. I maintained my cool (outwardly). I cleaned this huge mess up. Just as I wiped the last bit of milk, she was doing some dance and her hands came down and spilled the milk in her cup. At that moment, all patience left me. 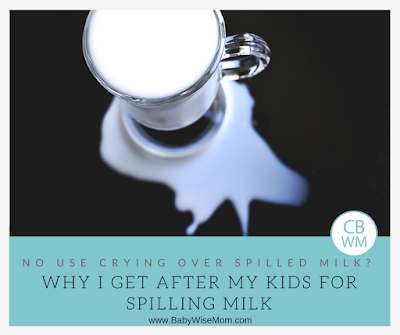 I literally thought about the advice “no use crying over spilled milk” and decided that is silly advice anyway. At least once a day, I was cleaning up a mess of spilled milk from McKenna and this was getting really old. I got her down from her chair, wiped her up, and informed her that she was done eating breakfast. Just then, my dad walked in the house (he was there to watch McKenna while I was gone), took one look at me and offered to clean the mess up for me. It is amazing how even in my 30s my parents can sometimes just save the day for me sometimes. Aren’t parents great? About a week later, a friend and I were talking about cleaning up milk spills and how old it gets when it hit me. McKenna hadn’t spilled milk since that day. It was, in fact, over a month and a half later before she spilled anything again. I realized something: sometimes there is use crying over spilled milk. Sometimes being unendingly patient about it just gives the child no reason to try not to spill it. She was obviously being careless before and had obviously put effort into not spilling. So I have a new policy. I don’t get upset over accidents–and I think that is partially what the old phrase is trying to teach us. Accidents happen, there is nothing we can do about it, and there is no use making a big fuss over a genuine accident. Even adults spill things sometimes. There is no use in crying over what you can’t change. You can’t change behavior that is purely accidental. I do, however, get upset over things getting spilled due to carelessness or general goofing around at the table. There will be a consequence for it. It might be as simple as a reminder to be more careful and that we don’t play at mealtimes (we can visit, we can enjoy each others company, but we don’t tickle or try to grab each other’s stuff). It might be that the child needs to have water to drink instead of milk so that the clean-up for carelessness is easy. Maybe the child needs to be done altogether–it is all case by case and moment by moment. And in these cases, crying over the spilled milk, so to speak, leads to behavior chage. So sometimes you do cry over spilled milk. Sometimes crying once over spilled milk can move the milk from being spilled at least daily to once a month at most. That is useful in my book. Excellent post. I love to see this side of you and your family. And I think I totally know what you mean! I am quite unlike you in that I am not very patient at all, especially in regards to carelessness. If something is a mistake, it's not usually something that makes me angry, but if Olive is careless because she's being silly and/or disobedient that absolutely infuriates me and she knows it (because I can't hide it). For better or for worse, she rarely makes those messes because she knows I will get very upset. I try to keep my frustration and anger in check because as general rule I don't think anger is a good feeling to be emoting towards any member of your family, but I think having your kids understand your displeasure can really help them curb those unwanted behaviors. btw, how much do you pay for your milk? Great post and I very much agree- although I try not to show impatience, in the case of spills etc due to carelessness or silliness, I have no problem in firmly informing them that the spill was due to their carelessness and implementing a light consequence. Normally i would ask them 'why did that spill?' 'because i left the cup on the edge of the table' 'ok, so no more cups for this meal' (we have a rule to keep the cups pushed back from the edge as that is the cause of most spills). I agree that the saying/cliche can help to not freak out at accidents or whatever but i do think kids need to understand the consequence of their actions – and help clean up the mess too so they know even in accidents, 'someone' still has to fix it all up! I loved this post! (Random unrelated thought) I have to admit I always have said it was such a silly saying until I started breastfeeding … then I really really really cry over spilled BM! HA! Natalie, our milk is 2.89 per half gallon. It is a lot more than the store! But tons better. Tastes better, it is real, and I don't ever have to go to the store for milk, so that saves money I am sure. Kate, I like that–no more cups if you spill because of carelessness. We have the same rule about cups not being at the edge. Go Long! LOL–I know it is so true.